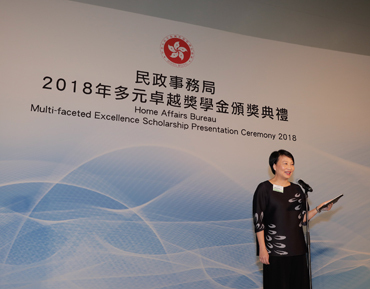 The Permanent Secretary for Home Affairs, Mrs Cherry Tse, officiated at the award presentation ceremony for the Multi-faceted Excellence Scholarship and commended 21 scholarship recipients with talents in non-academic fields. Photo shows Mrs Tse delivering a speech at the ceremony. 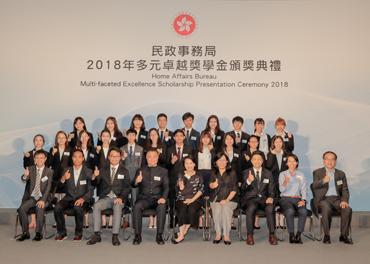 The Permanent Secretary for Home Affairs, Mrs Cherry Tse, awarded Multi-faceted Excellence Scholarships to 21 students for their achievements in non-academic fields including sports, arts and community services. Mrs Tse (front row, centre) and members of the assessment panel are pictured with scholarship recipients. The Government announced the launch of a six-month consultation to solicit views from the public and stakeholders on the recommendations of the review of the Private Recreational Lease (PRL) policy. 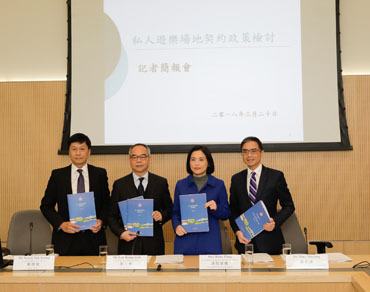 Photo shows the Secretary for Home Affairs, Mr Lau Kong-wah (second left); the Permanent Secretary for Home Affairs, Mrs Betty Fung (second right); the Commissioner for Sports, Mr Yeung Tak-keung (first left); and the Deputy Director of Lands (Specialist) (Lands Administration Office, Headquarters), Mr Tony Moyung (first right), at the media briefing on the policy review on PRLs today.